Emmanuel Macron seems to have royal aspirations. That is an odd statement to have to make about France’s new president. At 39, he is France’s youngest president in history; hardly a man who would have the gravitas necessary for the grandeur of royalty. A political centrist who favours greater European integration and globalisation, the forward-looking Macron would not have been the obvious candidate for a throne. And indeed it seems like Macron now desires to fill that void. Since becoming president, he has shunned media interviews and has adopted an icy cold demeanour, which contrasts heavily with his personality on the campaign trail. He seems to delight in the setting of the Palace of Versailles, most recently summoning MPs to hear his State of the Union style speech, a first in French history; he also chose to host Russian president Vladimir Putin there. As the French historian Joel Cornette says: “President Macron seems keen to look impenetrable, distant, sovereign — the trademark of Louis XIV”. This monarchial style is Macron’s intended way of ruling, a model he has termed “Jupiterian”, after the Roman god Jupiter. The president would no longer be easily accessible, nor would he speak much: he would only issue orders in public when needed. He would not micromanage, but instead the daily dirty work of politics would be handled by his prime minister and the cabinet. He insists that the French like the idea of a royal presidency. In a presidency that has so far been mostly about symbols and messaging, this is a symbolic move. Macron is a modern president, one who is ready to tackle the challenges of the modern day. He will not hesitate to use new technology. 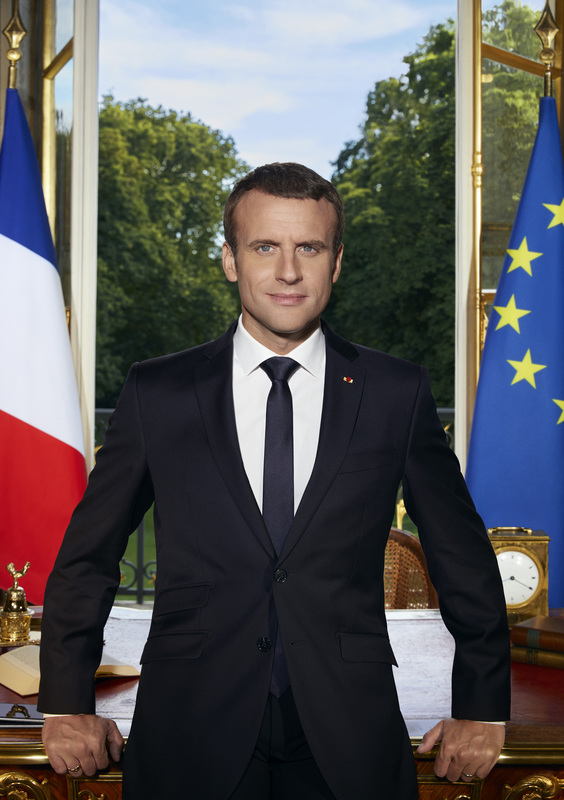 And, with his window open, his portrait is communicating that France and the presidency is open and ready to embrace the outside world. But that is a very distinct message from the Jupiterian, royal model of ruling that Macron has been so keen to display. So it appears that Macron wants the best of both worlds: a modern presidency encased in the trappings of tradition. Of course, it’s important to be aware that this is very much the consideration of style over substance; how Macron chooses to position himself has little to do with his ideas and policies, the analysis of which is best left for another post. But that does not mean that Macron’s style will not impact his success. In a fickle democracy, everything counts. At this juncture in time, with Macron’s presidency still in its honeymoon period, he may find the Jupiterian model to be well-liked. What Macron risks, however, is that inevitably when a crisis arises and his approval ratings begin to fall, he may find that his royal style makes him seem out-of-touch and aloof, unwilling to encounter the challenges of the common citizen. When that time arises, the monarchial presidency may not serve as a very useful model. Also, more simply, he risks being seen as in over his head. Macron should also be well aware that he should not overestimate his mandate. He and his MPs were elected with some of the lowest turnouts in French history. This means that France is not enthusiastically embracing him; rather, they chose him because the alternative, the xenophobic National Front’s Marine Le Pen, was unacceptable. But this also means that Macron is playing with high stakes. Le Pen, much like the Leave campaign in the UK, had ran during the election against a faraway, elitist bureaucracy in the form of the European Union that had completely lost touch with ordinary citizens. By adding another layer of aloofness through the monarchial presidency, Macron risks running the same accusations. The French probably did not elect Macron to have another distant, unaccountable president run their country. And should he falter, the probability of Le Pen and the National Front succeeding at the next election only rises. Finally, talking little also means that Macron risks losing control of his public messaging. In the world of today’s media, it is easy to not have your message gets through, and his lower profile surrogates may not be able to always communicate to the people for him. Macron would do well to truly embrace the more modern side of his presidency, such as the use of social media, and an aversion to talking to reporters is something more worthy of President Trump. Emperor Macron wants to reign. Yet that very fact may impede his rule.